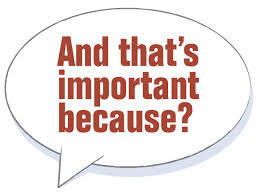 One of the most powerful words in sales and marketing is “because”….and it doesn’t get used enough. …with BECAUSE we can link ideas of logic and emotion. The linking of logic and emotion makes ideas far more powerful and memorable because we can feel and analyse simultaneously. More importantly though it is the word that links our knowledge to the clients needs. For Example: Which of these is more powerful? BECAUSE is the key link that makes our professional advice relevant to the client. It is the word that will move clients to act on the advice given. Because they will only act when the professional advisers analytical logic is linked to the clients emotional triggers.